Earth Oven variant: insulation in a basket over jumping bricks! Build Your Own Barrel Oven Book! Insulate! Insulate! Insulate! 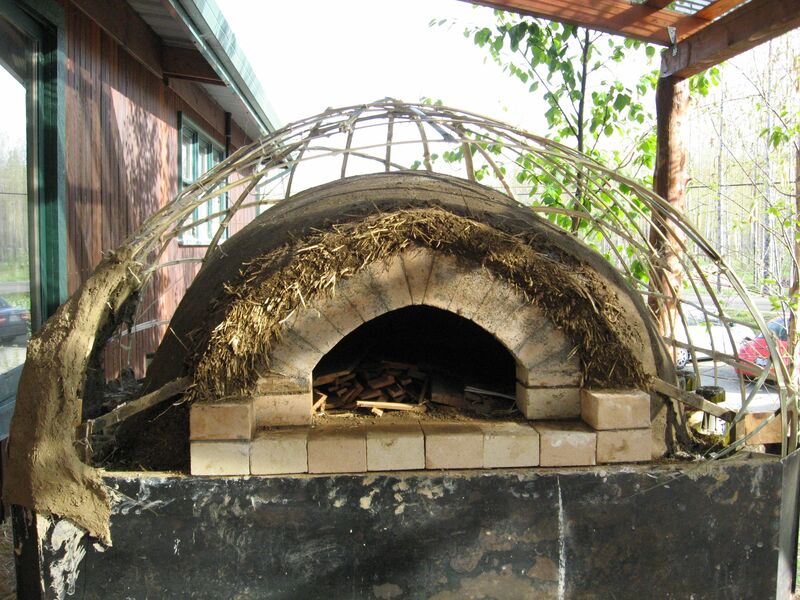 This oven gets used about 5 days a week, so it never cools down — partly thanks to 11″ of insulation under the hearth (vertical wine bottles in perlite), and about 8″ of loose perlite over the dome (poured into a basket made of bamboo covered in clay/plaster soaked burlap and mud). I built it for a local CSA farmstand restaurant (gathering together farm). The whole story (build and repair) follows, complete w/photos of making our own bricks and laying them up from the inside out! The oven started in a public workshop; folks came to make mud and learn and we built the basic oven in a weekend. I spent another week or so building a bamboo basket around the oven to contain loose perlite insulation. Loose perlite provides the best insulation value for the money, in my opinion. I then covered the basket frameÂ with mud-soaked burlap and more mud plaster, and finished it to look like a big land-turtle shell. And it’s the only way to prove to folks the truth of my favorite oven-building adage: “the second time is easier and faster.” But I let myself be convinced that the dome was adequately curved. It wasn’t. A year later, it was bulging downward, at the rate of about one eighth of an inch per month. Collapse was inevitable. nor did I want to put in that much (unpaid) time myself. without formwork! It’s traditional for ovens and vaulted or domed ceilings. I’d seen ceilings done this way in Mexico and wondered, “how did they do that! ?” as well as photos of German mud-brick ovens made the same way. 2018 UPDATE: This oven is now over ten years old. The bricks were a good solution to the problem of limited working space, but this and another oven built the same way have not held up as well as monolithic domes. If you have room to make the monolithic dome, I would recommend that over hand-made bricks. The edges of soft hand-made bricks wear easily. The result is that, over time, the mortar joints erode. The oven still works, but it degrades faster. This experience has raised some interesting questions for me about the history of human architecture. I wonder if the development of bricks had more to do with the need to find a convenient way to transport material. It’s much easier to move bricks than dirt (where bricks are stackable, dirt requires containers) — especially when fired. Laying brick, however, requires much more precision and attention to detail than shaping wet mud. And for houses, at least, the way that firing changes the thermal properties of mud is not necessarily an advantage. Neither is the added hardness. If you want to go with bricks, I would recommend pre-fired (commercial) bricks suitable for chimneys or fireplaces. Now when I make the thermal layer, I pay much more attention to the moisture content of the mix, keeping it dry enough so that I can compact the material really really well (like rammed earth — you can tell when you’ve reached maximum compaction by the sound that the material makes as you work). The result is a denser and much more durable layer than I can get with the bricks. note the cracking bulge at the top center of the oven ceiling. I cut a story stick that just fit under the bulge without scraping, to keep track of movement. After about a month, I could no longer slide the stick through without scraping. I figured the bulge had dropped another 1/8-3/16 of an inch. Fortunately, our raw clay-sand bricks had dried by then. here she wets the brick form (1.5″ deep: scrap 2×2 — thin bricks are best for domework, as they make better curves, and their lighter weight means less risk of slippage when you’re setting them). Next, she sprinkles sawdust (we didn’t have any sand), so the brick will slip off the board. Throw two handfuls of mud into the form; if you throw it right, the corners come out clean and sharp. pull the form: the brick is ready to slide off onto a flat surface for drying. here’s our stack of about 220 bricks, with form. Here’s the outer surface of the oven — a thin shell containing perlite insulation. I cut a hole in the bottom side to drain out the perlite (used a sawzall — it was like cutting plywood! tough stuff!) I used a piece of old roofing tin to make a chute to direct the flow of perlite. It poured out like water. Nasty dust. A good mask is well worth the money. Eventually, I cut out a large, wedge-shaped piece of the entire shell. There was virtually no cracking as a result of any cutting. The shell was super-strong and rigid. Note the bamboo armature underneath. good insulation! The bamboo, which was just temporary formwork for the fireproof plaster shell while it dried, is still completely intact: not even charred! 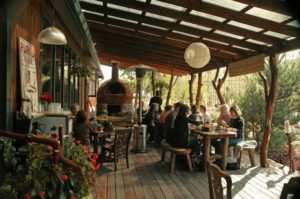 The bamboo supports a layer of burlap impregnated with clay slip and gypsum plaster for a quick-setting, stiff, and fireproof surface that could be plastered immediately. indeed, it was barely toasted! I would guess that the temperature at that level barely got over 3-400 degrees F.
In cross-section, you can see the layers of the fire-proof shell that holds the insulation. From top to bottom: white is gypsum and clay impregnated burlap with some sandy-clay plaster, then a layer of insulating and sculptable plaster made of clay and sawdust, then a layer of fine clay-sand finish plaster. The surface at the bottom of the photo is the top of the oven dome, made of pure sand and clay. Above that, looking like the edge of a cliff, is a layer of sawdust mixed with clay slip. This close to the heat, the sawdust gets hot enough to completely burn out, leaving an insulative clay foam. It works well, but crumbles at a touch. The white above is perlite, which was pretty well contaminated with the crumbs of crumbled clay-foam, so we had to buy new when we refilled the insulation cavity. The thermal layer comes down. Note thickness of shell. The dense thermal layer was not hugely massive because the oven is used primarily for pizza and just a bit of bread. However, with 6-10 inches of perlite all around, it held heat extremely well, and performed beautifully. Thermal layer completely cleaned out. Note the bottles in perlite exposed around the edges of the floor bricks. The bricks on edge around the perimeter are a “bumper course” to protect the softer mud dome from peels and firewood. the hole in the shell was just big enough for me to step into the oven and sit on the floor. I’m very glad I didn’t have to wiggle through the door in order to work! the mortar is just clay and sand, like the bricks. Building an oven with bricks this way means that you can use more clay in the mix; because the bricks are relatively thin and small, they shrink without cracking. The clay is generally more durable under constant use than a typical “cob” mix, which uses a higher percentage of sand to limit cracking. at work: I was very glad when I realized I could just cut out a big doorway right through the shell. Originally I’d thought I would have to wiggle through the door and work lying down! I had to clean the bottoms of the mortar joints by feel because I couldn’t get low enough to see ’em! I tried to work as symmetrically as possible, but it’s definitely very different than laying up a straight wall. toward the end, I had to enlarge the opening of the shell just to be able to maneuver. I used the spray bottle to wet out dry surfaces to take the mortar better. these last bricks were almost vertical, but were also held in place by being wedge-shaped. Since the bricks were raw (unfired) they were easy to cut with an old Sawzall blade. final courses close the dome. hard to clean the insides of the final mortar joints; I made a long handled tool that reached through the doorway to scrape the joints clean. not much structure is needed to support the burlap and gypsum plaster, which is self-supporting once it sets. However, I did “tie” the main bamboo struts with “straps” of gypsum-soaked burlap that wrapped around the bamboo and over the outside of the shell. These got trimmed after the gypsum set. Thanks for sharing Kiko the step by step great photos. I read your post about sodium silicate as a mortar. Then looked up sugar soap and noticed it has the exact same ingredients as “magic water” from CeramicsArtsDaily site. Do you think its a safe substitute. So far I’m making a small clay and grass rocket stove and the next day its my sculpture and firmed up rather quickly. Thanks for your speedy reply… “magic water” is the term for terra sigilatta / sodium silicate mixed with water and sodium carbonate. Ok, shall experiment! Wow Kiko! That was amazing to see the step by step. I would love to try this. You have given me an idea for a sauna! Hey, ya, pumice is good. So is the sawdust and clay. For more amazing examples and inspiration about domes, look up the work of one Gustavino (here’s an article in Make mag, and an MIT site, gustavino.net — stuff to dream on. Many thanks for sharing your experience. I love this article – it is so inspiring to see how one could repair (for less) an oven. The wisdom of the story : keep a mud build oven dome high and always use your spare time to make bricks! What are the measurmements (in metric if you can) for the small adobe bricks and how do you make them (the frames)? Hola, Amelia: bricks should be sized to your oven (width of brick = thickness of dense layer). The thermal layer for a home oven should be about 3″ (7.5 cm. ), and well insulated! Length of brick = 2x width. thickness no more than 2.5 – 3 cm. Frames are just bits of wood nailed together. Very simple. By the way, a new edition of the oven book is soon to be published in Spain by Ecohabitar(.org)! Hola Kiko, thanks for your reply, will be watching out for your book in Spain ( as a gift for friends for i have my own original version :-). BTW do you happen to have any pics of how you did bricklaying around the front arch, do the mudbricks repat the curvature of the firestones of the arch (and could you do it without any from of support)? What do you think about several layers of empty bottles with perlite in the cavities between them in the insulation basket?